The feature film Tigers, about a formula company salesman, is being screened in selected UK cinemas and on the ZEE5 streaming channel. This is not just a film that will bring the baby milk issue to a mass audience, Tigers is a film with a pedigree. 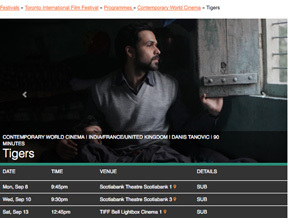 Follow our special Tigers page for the latest news and screening information. In a neat piece of narrative structuring on Tanovic’s part, this David-and-Goliath story is told partially through the eyes of a film crew making a documentary on Ayan’s astonishing findings. Danis Tanovic is an Oscar (Academy Award) winner for No Man’s Land, which took Best Foreign Language Film in 2002 – and many other prestigious awards besides. Emraan is a very popular Bollywood actor and his involvement has already generated hundreds of articles since the announcement. Co-starring as his wife is Geetanjali Thapa, (Pune Mirror reports on how they got on). Tigers is set in Pakistan, but was filmed in India. Ironically India has strong marketing regulations that stop baby food companies promoting their products as they do in Pakistan and many other countries. Sales remain static in India, while growing exponentially in countries such as China, with poor regulations. There are other big names in the film. Danny Huston and Maryam D’Abo have a long list of credits. (Maryam, for example, starred in the James Bond film, The Living Daylights – where her character and Bond escaped the bad guys using a cello). The international cast includes German actor Heino Ferch (Albert Speer in Downfall). The screenplay is credited to both Danis and Andy Paterson. Andy is also listed as a producer; his past productions include Girl with a Pearl Earring, The Railwayman, and Hilary and Jackie. Other producers have been responsible for films such as The Lunchbox. I am sure there are many other names that deserve highlighting for their past work. It is quite a team. Baby Milk Action acted as one of the Consultants to the film makers. We are confident that the story they will tell will shine a light on the baby milk issue and the power of corporations, and we encourage everyone to see it. Watch the trailer on our special Tigers page and find the latest news and screening information.